Earlier today I embarked on the task of trying to win a Shorty Award for @stopstalkingme (my daughter) in the "other" category of BESTUSERNAME. You must admit that she has a very creative avatar name. I used my twinfluence to try to generate some votes, and by mid-morning she had made it to the top 100 nominees page, and soared into the 30s by lunch time. I have to admit that the success of the campaign took me by surprise. To see her higher in the voting than some major Twitter luminaries was quite the fun. BUT, this is no time to rest on one's laurels. We have to get out the vote. 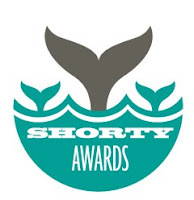 So if you haven't already voted tweet right now: @shortyawards I nominate @stopstalkingme in category #bestusername because... (and add any silly reason you want-- be creative). We can win this thing!